The Achievement School District (ASD) has just approved Cornerstone Prep to transform the Lester Middle School beginning next year. Cornerstone Prep will be leading pre-Kindergarten through sixth grade for 2013-2014 and then will be responsible for the entire school, pre-Kindergarten through eighth grade the following year. This allows Cornerstone Prep to serve every child in the Lester Elementary School district in 2014 and then every sixth-, seventh- and eighth-grade child in the entire Binghampton community the following year. 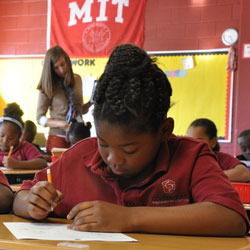 Cornerstone Prep looks forward to similar results in grades six through eight in the years to come.